Marina Blue luxury residences set the gold standard for high end living in Downtown Miami. Located at 800 Biscayne Blvd., directly on the shores of the Biscayne Bay and next door to the American Airlines Arena. This beautiful and shimmering glass high rise is home to 516 total units. One, two, three, and four bedroom models are currently available for purchase. The smallest models, one bedroom, 833 square foot, luxury residences start at just $415k. The largest, four bedroom 4,498 square foot, lofts sell for just $5.9M. In addition to the excellent location of Marina Blue, the interior design scheme projects a modern elegance with plenty of room. Nine foot ceilings come standard in all residences. Penthouse suites include cavernous 18 foot ceiling heights. Kitchens include European kitchen cabinetry, granite kitchen countertops, designer kitchen appliances, and stainless steel double sinks. This fully loaded kitchen at Marina Blue luxury residences in Downtown Miami is fit for chefs of all cooking levels and styles. Master bathrooms are a unique wet room style with glass enclosed bathtubs and individual showers. Residents and guests to Marina Blue are greeted by a spherical porte-cochere entrance and 24 hour concierge. Room service and housekeeping services are also available to all full time residents. Enjoy the bayfront swimming pool with lap and recreation areas. Work out in the cutting edge fitness facility with cardio and aerobic rooms. Marina Blue is also home to a yoga studio and regular classes. Conduct business in the communications and conferencing facility. The indoor and outdoor rooftop SkyLounge is one of the hottest places to hang out in Downtown Miami. Catch some rays on Marina Blue’s very own beach volleyball court. Enjoy the peace of mind that your property is monitored by 24 hour security. Living at Marina Blue puts you right in the middle of the action in Downtown Miami. DIrectly next door to American Airlines Arena, it would be a dream come true for a Miami Heat fan. If you prefer art, you’ll be just blocks from the Perez Art Museum and the Bayfront Park Amphitheatre. Take a walk in nearby Museum Park, home to dozens of bird and wildlife species. Marina Blue is close to Miami beach and provides direct access to Fort Lauderdale and Miami International Airports via I-95. Downtown Miami is home to dozens of world class dining, shopping, entertainment, and nightlife options as well. 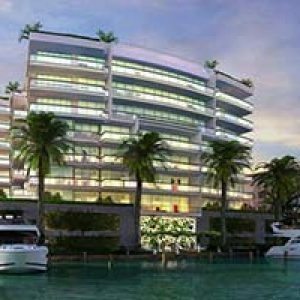 Don’t miss out on this opportunity to own five star South Beach luxury on the shores of bay at Marina Blue.